Red Tree - Glenbrook Avenue, Clayton, originally uploaded by avlxyz. 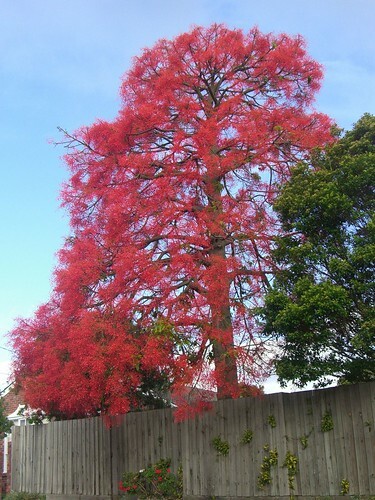 This has to be one of the most spectacular images of a flame tree that I have seen yet! To start with the size of the tree is a lot bigger than most that I have seen. This tree is a Brachychiton Acerifolius, native to Australia. Having come across your site I have finally confirmed that we have a Illawara flame tree. It is also really big - about two stories high. And in fact the trunk splits into two. Is that usual?